This article was written 2 years ago at the time that ISIS terrorist was at the peak of there power, it is still worth reading it! The Kurdish struggle for national liberation is one of the longest in the Middle East. The 30 million Kurds are the largest ethnic group in the world without a state. 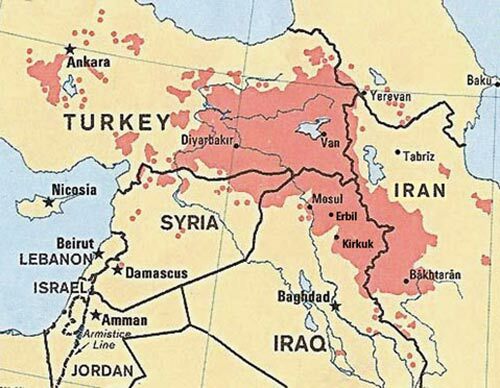 At the end of First World War the major powers divided the Kurdish areas between four nations: Turkey, where most Kurds live, Syria, Iraq and Iran. US President Woodrow Wilson promised there would be an independent Kurdish state within four years. But the Treaty of Lausanne (1923) which created the states of Turkey, Syria, and Iraq, among others, brokered by the League of Nations, gave the British control of Iraq and its oil. This left the historic Kurdish territory divided among Turkey, Syria, Iraq, and Iran (formerly the Persian Empire, which had been occupied by the British during the war). The Kurds were abandoned by the US and the other great powers. It was the first of many broken promises. But the Kurds fought on against oppression in all of the states among which their people were divided. Great power hypocrisy is just as evident today as it was after the First World War. While the US and the European Union arm the Kurds in Iraq, the very same US, European Union and Nato forces declare the Kurdish Workers Party (PKK) to be a terrorist organisation. The PKK is banned as a terrorist organisation in the UK. In the PKK’s long armed struggle against the Turkish state it has seen many thousands of its members killed, imprisoned and tortured. To this day, and despite a current ceasefire, the PKK leader Abdullah Ocalan remains in a Turkish prison. The main powers strategy for most of the 20thcentury was to keep the Kurds divided among the four nations where they lived and allow the local states to go ahead in suppressing them. This was the policy of Turkey, whether under the military or Erdogan, of Syria under the Assads, both father and son, and in Iran under the Shah and the Islamic State. Iraq under Saddam carried out brutal repression of the Kurds. When the US invaded Iraq in 2003 it saw a chance to use the Kurds’ opposition to Saddam for its own purposes. First it used them ideologically, highlighting their oppression and in particular the Halabja massacre of the Kurds in 1988 - although at the time the US backed up Saddam’s attempt to blame Iran for the attack. Then they used the Kurdish areas as a base for the invasion. Then by granting the Kurds effective autonomy they made them part of the divide and rule strategy which led directly to the sectarian structure of the occupied Iraqi state. It is this, in turn, which has given the Islamic State (IS, formerly ISIS) the chance to grow out of the alienation of Sunni Muslims in the US constructed Iraqi state. Thus, as we have argued elsewhere, the current threat from IS is a direct product of US policy in Iraq. The US prefer the autonomous Kurdish region of Iraq now because they want to use it against the threat of IS. But they also prefer a weak and divided Kurdish nation to a united and free Kurdistan. ‘the fact that the Kurds were willing to deal with Israel implies that they intend to pursue a more magnanimous foreign policy than their Arab neighbors, which maintain a boycott of crude sales to Israel’. This is why Israeli prime minister Benjamin Netanyahu has come out in favour of independence for Iraqi Kurds but remains resolutely opposed to full independence for Kurdistan as a whole. Israel hopes for a divided and weakened Iraq, and must be hoping the same might happen in Iran if the momentum for Kurdish independence carries across the border. The fact that the US, Turkey and Israel are playing their own game with the Kurds does not for a moment cancel out the Kurds fight for independence. But it does mean that if that struggle is not to be diverted into (and limited to) a pro-imperial rump statelet in northern Iraq then the full demand for a unified and independent Kurdistan must be in the foreground of Kurdish agitation. The Iraqi Kurdish leadership has done too many deals with too many reactionary forces to be trusted. In the past it has even supported Turkish military operations against the PKK. Even now, when there is a degree of unity among Kurds in the face of the threat from IS, one analyst says of the supply of arms ‘Perhaps something would end up with the PKK, but [does Barzani, the leader of the Iraqi Kurds] really want that to happen? I don't think so’. ‘Barzani and his security apparatus failed to realise that the forces of the IS have the same genocidal roots as the people who committed Anfal in the late ‘80s, when 182,000 Kurdish villagers, many of them women and children, were murdered. US officials have reported that Sinjar was poorly defended and the peshmarga withdrew without a fight. Yazidi Kurds will never forgive KDP leaders for this historical blunder and they will take years to recover from their terrible wounds’. This kind of co-option by the major powers is not new. Marx and Engels were highly critical of small nationalist movements drawn into the role of imperial proxies in the 19thcentury. It happened to sections of the Irish republican movement both in the 1920s and the 1970s. It happened to the Kosovo Liberation Army, which became Nato’s ground forces in the Balkan War. And it happened again to Libyan opposition forces under the Nato air war in 2011 and to the Free Syrian Army, with disastrous consequences in both cases. And it has long been an overt part of neo-con strategy to use elements of a popular movement to obtain the removal of regimes the West dislikes. But it is not inevitable, even in world where the forces of socialism and popular national liberation are weaker than they were a generation ago. An independent Kurdistan across the whole of the territory would be the one development that could stop IS in its tracks and marginalise the Iraqi Kurdish leadership. The post First World War settlement is breaking down, but it is breaking down in favour of reactionary forces. A unified and free Kurdistan would offer the beacon of a national liberation struggle that had a popular and progressive outcome. It would, in the current situation in the Middle East, have the effect that the ANC’s victory over apartheid had in southern Africa. It would set up a pole of political attraction and a liberated territory which would be impenetrable to IS and much more difficult for the imperial powers to co-opt and exploit - which is exactly why they don’t want it. The Kurds have a long and heroic record of anti-imperialism. Some of the Iraqi Kurdish leaders are selling that legacy short. But the Kurds cannot profit at the expense of other Kurds or the Palestinians. The best defence against IS is not US weapons or a pro-Western oil policy. Some Kurds will say ‘but what should we do about the IS onslaught now?’ And the pro-war hawks are already writing off the history of previous disastrous interventions with the cry ‘but this is different, we can’t let the Kurds fight alone’. We now know from past experience that the panic call ‘something must be done because nothing could be worse than this’ run very hollow in the long run. We were told that nothing could be worse than Saddam, he is murdering his own people’. But war and occupation added to the death and suffering. We were told in Libya 'Benghazi will fall, nothing could be worse'. But what happened then was worse: 30,000 dead and the country reduced to a disaster zone from which arms flow around the region. Our reply should be ‘Yes, of course the Kurds have the right to armed self-defence, but getting into an agreement with the US which will also mean a US bombing campaign will increase death and destruction. It will also increase the weight of all the reactionary forces among the Kurds’. The best defence now is to step up the call for a unified Kurdistan and exploit the divisions among the Nato powers. This is also the best way in the long run to stop IS.